Dr. Jordan Peterson, a Canadian professor of clinical psychology at the University of Toronto and Great Books autodidact, has captured public imagination and outrage in equal measure. He has garnered wide-ranging interest—with his lectures on YouTube being viewed upwards of 300 million times—in a way that other intellectual heavyweights from the Great White North, such as Charles Taylor and George Grant before him, have not. His supporters acclaim him as an ardent defender of free speech and a voice for common sense. His opponents condemn him as an obtuse bigot. But love him or hate him, there can be no doubt that Peterson has started an important conversation about the limits of free speech, the downsides of coercive “group-think,” and how the principles of a free society can help us live together amidst deep difference. While Peterson’s arguments against political correctness are what he is most well-known for, the real substance of his ideas is surprisingly difficult to pin down. This is partly because obtaining a thorough understanding of his views requires sifting through hundreds of hours of YouTube videos and also partly because Peterson’s political philosophy is unusually multifaceted. Not to mention that he spends most of his time thinking and teaching about people and ideas that the average person hasn’t necessarily heard of (let alone have strong thoughts on), and that do not have obvious political implications. While simplistic, Manichean characterizations rarely do anyone justice, Peterson in particular, because his interests are expansive and his breadth of reading vast, requires a more meticulous examination. Without seeing the questions that he is trying to answer it is impossible to fully understand where he is coming from and what he is trying to say. Indeed, many attempts to capture his thought neglect to thoroughly examine the way that his most salient intellectual influences inform his thinking. “I’m not making a case for conservatism. I’m not here to make a political case,” he claims in his “12 Principles for a 21st Century Conservatism,” a YouTube video with nearly half a million views. “I’m here to make a philosophical and psychological case. That’s what I’ve been doing all along.” So, to understand Peterson let us to turn to the literature, ideas, and individuals with which Peterson has spent his life grappling. Unlike other thinkers characterized as conservatives, Peterson’s chief influence is not Augustine or Aquinas or Locke or Burke or Strauss or Hayek—it is the Swiss psychologist, and (part-time) friend of Sigmund Freud, Carl Jung. Jung’s influence on Peterson is explicit—for Peterson to mention Jung only once in a lecture is anomalous—and Jungian psychology is also manifest in Peterson’s political philosophy. Central to Jung’s psychology is “individuation,” or the process by which a person becomes fully himself as an individual by developing personality traits, cultivating interests, discovering fears, uncovering foibles, and establishing beliefs. Jung dedicated his life to studying the process of become fully human, or “personal quest for wholeness.” Among many (many) other things, Peterson takes from Jung is this emphasis on the individual: for Peterson, respect for the individual’s ability to form and hold opinions of their own, is fundamental. For example, Peterson has come under fire for standing in firm opposition to “left-wing activists” who he claims use the plight of transgendered individuals to force their ideological orthodoxy on others. For Peterson, individual expression and the zealous pursuit of truth is paramount, even at the expense of someone’s feelings. In the now-notorious interview with Cathy Newman on Britain’s Channel 4 News, Peterson asserts that the philosophy that drives trans activists is, at bottom, the same as the leftist tyrannical regimes of Maoist China and Soviet Russia: these philosophies, according to Peterson, assume that group identity is paramount and exalt group identity over identity of the individual. 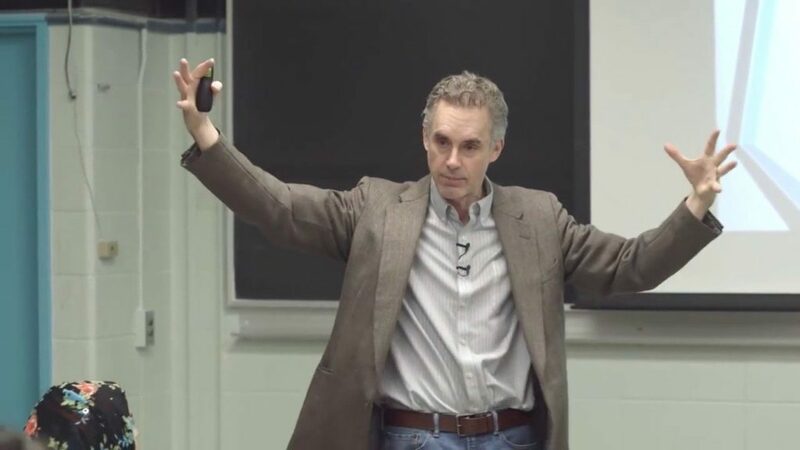 For Peterson, who attests to spending tens of thousands hours studying totalitarian regimes of the 20th century, the politics of group identity and political correctness are antithetical to respecting an individual’s ability to be and to think for oneself. In addition to being a thoroughgoing Jungian, Peterson, who has called himself “an existentialist at heart,” draws deeply on existentialism throughout his lectures. In particular, Peterson finds in existentialism support for his belief in the importance of individual identity and for his posture of intellectual humility. If there is a “creed” of existentialism it is, perhaps, the words of French existentialist philosopher Jean Paul Sartre—existence precedes essence—which upended the traditional view that a thing’s fundamental nature (essence) is more foundational than the mere fact of something’s being (existence). From this, existentialists maintain that there are intrinsic and insurmountable limitations on our ability to reason our way to the truths of the fundamental nature of the world. Rather than being a systematic and comprehensive system of thought, existentialists are united in their rejection the “iron-cage” of reason, claiming that there remain important parts of our existence that reason cannot help us understand. Man is only a reed, the weakest in nature, but he is a thinking reed. There is no need for the whole universe to take up arms to crush him: a vapor, a drop of water is enough to kill him. But even if the universe were to crush him, man would still be nobler than his slayer, because he knows that he is dying and the advantage the universe has over him. The universe knows none of this. Thus, our dignity consists in thought. Hence, for the existentialists, our rational thought, a fundamental attribute of our existence, is one means by which we determine our character, the direction of our life, our personality — our essence. This sense of agency is fundamental to Peterson’s worldview. Peterson emphasizes personal responsibility and efficacy in what he decries as a rights-obsessed culture. He opines that modern society has emphasized rights at the expense of duties, promoting instead a culture of victimhood. This helps explain why the world is watching a heretofore unknown Canadian academic: his message reminds people that they can control their life, and that their life matters. Indeed, in some respects Peterson is a sort of intellectual Tony Robbins. But his point is not just appealing. It is important. Peterson, who believes that life has genuine meaning, says that attaching correlative responsibilities to rights is an important part of how humans find meaning. To focus on rights without duties results in solipsism and unhappiness. Without the “voluntary adoption of responsibility” to family, friends, community, or country, our lives lack direction and purpose. Peterson also borrows from existentialism a skepticism of reason’s pretensions. Responding to the rationalism of the philosophers of his day, notoriously inscrutable Danish existentialist Søren Kierkegaard wrote, “People understand me so poorly that they don’t even understand my complaint about them not understanding me.” Kierkegaard thought that contemporary society worshiped the idol of knowledge which led to a culture of hubris and bourgeois vanity. His solution, as any student of Kierkegaard knows, was to make his writing as impenetrable as possible. By making his ideas incredibly difficult to access, he aimed at dismantling the Enlightenment notion of confidence in science and knowledge of the world around them doing so. Peterson’s commitment to the idea that there are things that science cannot answer or explain—but that are nevertheless an important part of the human experience—is integral to his thinking. As he stated in his Biblical Series on Chaos & Order, “The evidence of religious experience is incontrovertible. It is also inexplicable.” Peterson reminds us that there is much to life that is miraculous and misunderstood, and that leaving room for life’s incomprehensibilities may allow us to be less likely to cut off, demonize, and condemn those with whom they disagree. In his Parable of the Madman (from The Joyful Wisdom), Fredrich Nietzsche famously wrote, “God is dead. God remains dead. And we have killed him.” By this, Nietzsche proclaimed that the Enlightenment’s confidence in scientism and human knowledge had finally and forever displaced the previously central role of sacred truth and Christianity. Unmoored from the God-ordained morality and values of Christianity, life is defined by cosmic purposelessness and suffering. The world has no objective order or reality. It is up to us to define our own truth, purpose and reality for ourselves. Much of Peterson’s philosophy is responding to Nietzsche, and it does so in two ways: He agrees with Nietzsche that life is hard and will inevitably involve enduring misery. To survive, one must be prepared for this. But for Peterson, preparation does not involve defining one’s own truth and reality, as Nietzsche said. Instead of assuming the world will conform to one’s own will, Peterson advocates the importance of taking responsibility for oneself and living in accordance with the objective reality of the world around us. For Peterson, there is objective truth and reality, and we cannot simply transcend all moral frameworks and create truth for ourselves. As Peterson frequently reiterates: “Pain is the fundamental reality. It’s the only thing that people will not deny.” We are not beings who can create a moral framework out of nothing; we are instead destined to live within the constraints of life in order to survive and succeed. To deny these constraints leads to chaos—internally, interpersonally, societally. This is the main point of Peterson’s recently released Twelve Rules for Life: An Antidote to Chaos, wherein he lays out a moral framework that he believes will help people live life to the fullest—however unavoidably tragic life may be. Rule Eight: “Tell the Truth—or, at least, don’t lie,” addresses the Nietzschean, post-modern axiom of the subjectivity of truth head on. Peterson contends that we intuitively know what truth is, and that “lies make you weak and you can feel it . . . you cannot get away with warping the structure of being.” Thinking that you can lie and get away with it is arrogance, and to act in disharmony with the rules of the universe invariably has negative, long-term consequences. Similarly, Rule Seven — Pursue what is meaningful, not what is expedient — also defies Nietzschean nihilism and corresponds with Peterson’s understanding of an objective reality. “Meaning is what we do to buttress our self against the tragedy of life … our pursuit of meaning is an instinct. Perhaps our deepest instinct… meaning is the antidote to the malevolence of life.” To deny meaning exists, to pursue happiness instead of meaning, or to seek meaning in the wrong things will lead to chaos. But Peterson borrows from, in addition to criticizing, Nietzsche. Both men rail against the “last man,” the human type that seeks to shirk risk and responsibility in favor of comfort and safety. Like Nietzsche, Peterson’s view offers an “ideal human type” that lives by a superior code. For Nietzsche it was Übermenschthat lived by a code of his own creation— a “master morality” of “might makes right,” also popularized by Thrasymachus in Book I of Plato’s Republic. For Peterson, the ideal is a mode of existence wherein one lives within the preordained structure of the universe and nobly grits the challenges that life throws their way. The above illustrates the diversity of Peterson’s intellectual interests. But while these examples can be a helpful starting point to understanding themes Peterson enjoys returning to, they are by no means exhaustive. Other of Peterson’s recurring intellectual influences that were not discussed above and not have obvious political implications, but are worth examining in their own right, are: Peterson’s view on the importance of dreams (they are, after all, the subconscious mind communicating to us); prehistoric myth, particularly the creation narrative of the Sumerian deity, Marduk (which is a metaphor of how to use language to confront that which frightens and upsets us most deeply); dominance hierarchy (which the close study of lobsters, our ancestors from billions of years past, can greatly inform); and the centrality of Hebrew Scripture to understanding wisdom so as to become fully human (which teaches us lessons about discipline, sacrifice, and faith that science and rationality cannot). The above also illustrate the emphasis Peterson places on how the inner life informs our outer conduct. In this way, Peterson stays true to the literal meaning of psychology, Greek for the “study of the soul.” We can be grateful to Peterson’s reinvigorated discussion of the inner life, as today, far too little attention is paid to the care of the inner life, our deepest self, our essence — perhaps because it is infinitely complex and it is far easier to pursue the simple and certain.